Running a freelancing biz is no joke. You need to think about everything from creating invoices, writing proposals, drafting contracts and, of course, tracking expenses. 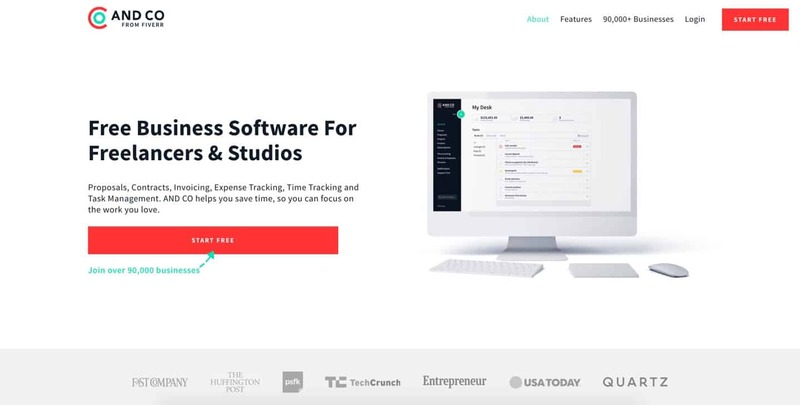 Fortunately, we have plenty of options when it comes to freelancer-focused business management software, and this one certainly has a strong foothold in the market. With Fiverr's recent acquisition of AND CO, the $168 annual fee has now been removed, making the software 100% free to use. UPDATE: As of March 11th, all existing free accounts will be downgraded to a very limited plan. You will once again be required to pay $168/year. A classic bait-and-switch from an AND CO team who assured me this wouldn't happen. Very disappointed. Given the initial barebones feel of AND CO, I was expecting to tell you that it doesn't have any project management capabilities. I guess that's why they say you should never judge a book by it's cover. Don't get me wrong, this thing isn't going to replace the likes of Asana or Trello anytime soon. I mean, there's no Kanban or timeline layout, no templates or complex workflows, and no custom fields or colour coordination. You do, however, get an organized way to keep track of projects, add tasks, associate time, record expenses and even attach files. I'd argue that anything more should be left to a dedicated project management tool like the one's I mentioned above. Overall, not a whole lot more to talk about there. It's fairly basic, but solid. I don't know about you, but writing out proposals and contracts has to be one of the most boring aspects of running a freelancing business. AND CO proposes a solution that I think you'll like. Not too overwhelming, which is always nice. You enter a project name, set the total project fee, payment terms, start/end dates, deposit amount, etc. Then, you click next, and AND CO works some magic to generate a pre-formatted, proposal based on your inputs. While a lot of the work is done for you, it's still fairly basic as far as proposals go, so you'll need some manual input. 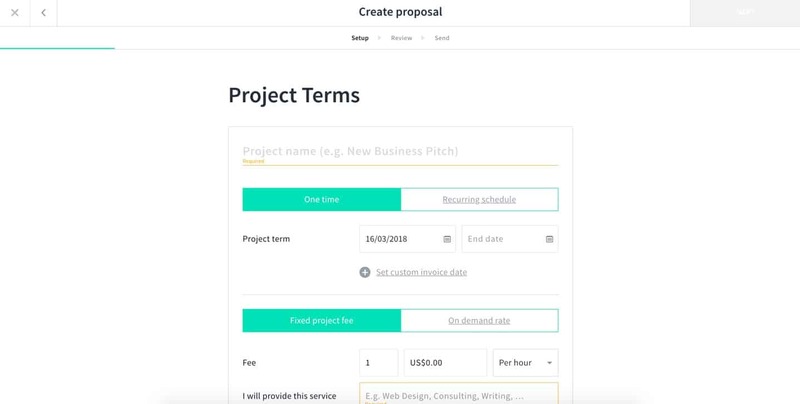 As you can see from the screenshot above, AND CO does let you slot in a new sections to bulk out your proposal with more information. 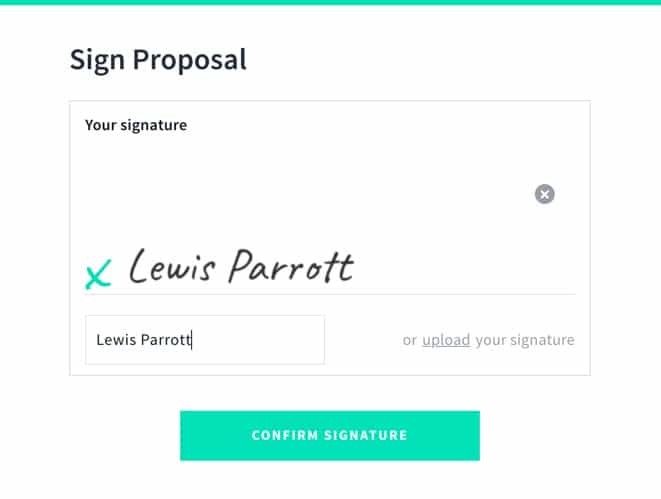 You then pop in a virtual signature and send it off to the client. Easy peasy. The great thing about this process is, AND CO will ask if you'd like to attach a contract to your proposal. All the thinking is done for you. You literally just have to make sure the values are accurate, with many the fields offering a simple multiple choice. Then, you guessed it, AND CO turns it into a pre-formatted document. 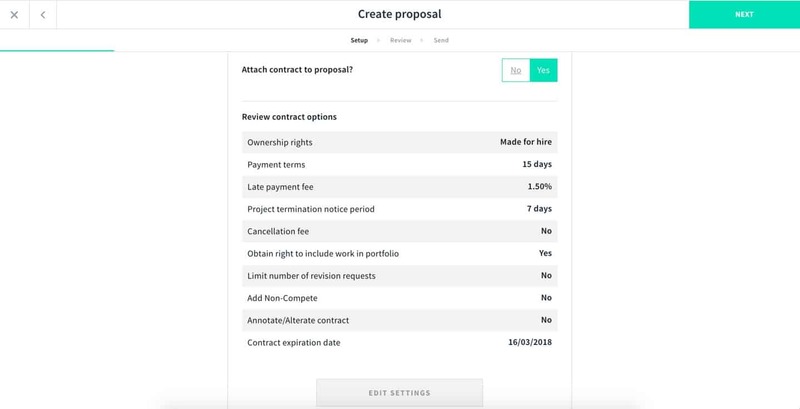 You can even request payment on approval, meaning you don't have to follow up with an invoice if the client agrees to move forward. This is done through the "deposit" option, and set as a percentage of the overall project fee. 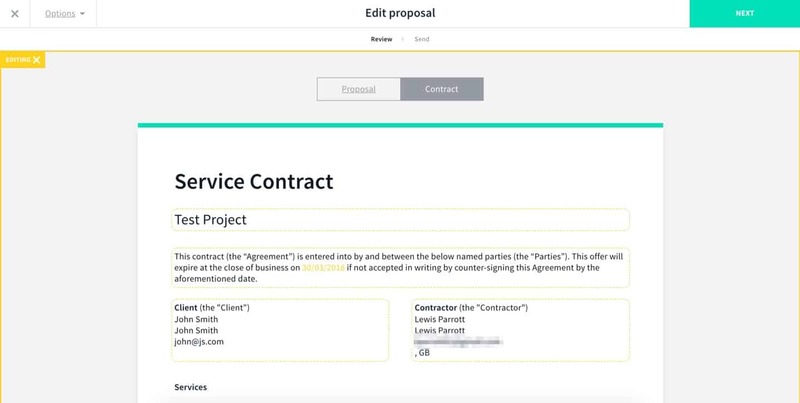 After setup, AND CO will send your prospective client a link to view the proposal/contract. Fortunately, the client doesn't need an account in order to approve the proposal and make payment. Overall, super easy to set up and a very smooth process on the client-end as well... what more do you need? You can't get paid without first sending an invoice, which makes invoicing one of the most crucial aspects of running your business. The good news is, AND CO has an invoicing feature baked right into the platform, and as you might expect by now, the step-by-step setup interface is just... flawless. 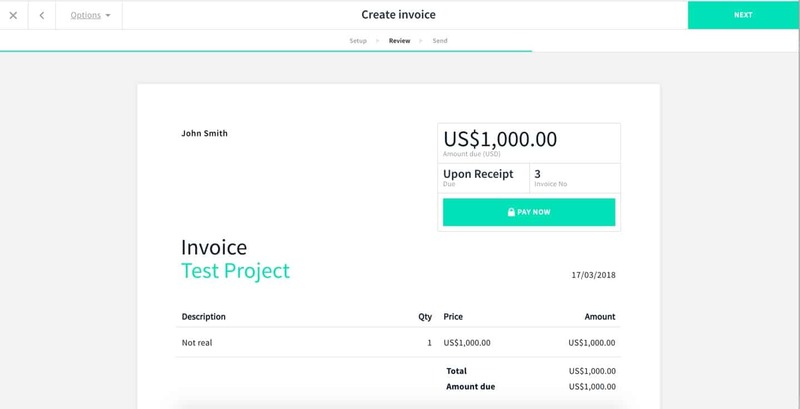 Clicking next will generate a pre-formatted invoice that can be easily customized to your taste. Once you're happy with changes, simply hit send and wait for your client to make payment. Speaking of payment, what payment options are even available? Well, you get the usual Stripe and Paypal integrations, and these sync up nicely with your invoices and subscriptions. 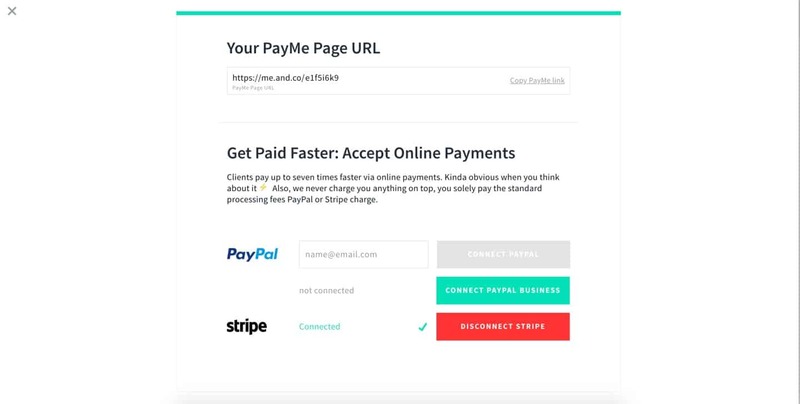 You may also notice from the screenshot above, AND CO gives you something called a "PayMe" link. 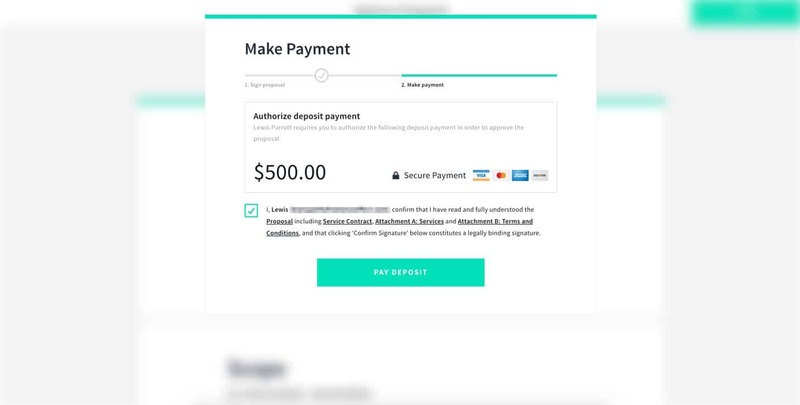 This is essentially a way for clients to make quick, custom payments without you first having to generate an invoice, etc. I think it's a great idea and something I'd certainly use myself. 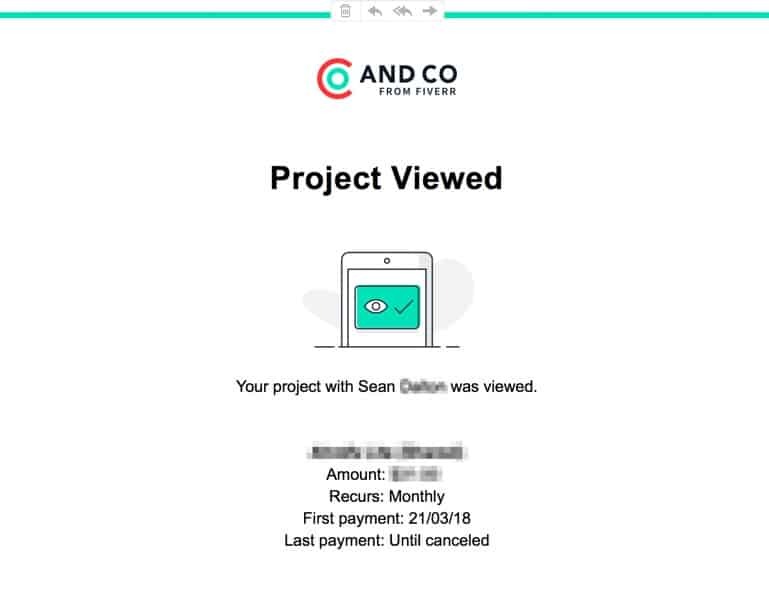 Granted, AND CO doesn't offer the most feature-packed invoicing solution on the market, but they're clearly focusing on simplicity. Is that a good thing? That's up to you to decide — but I can totally see why some freelancers would go for this over more complex solutions. While I'm not a huge fan of this approach to billing, I realise it's something many freelancers and clients rely on. After clicking the 'Time Tracking' menu item, you'll be able to choose from any of your active projects in order to start tracking time. As basic as this all looks on the surface, there's a few key features that are actually quite useful when you dig into them. 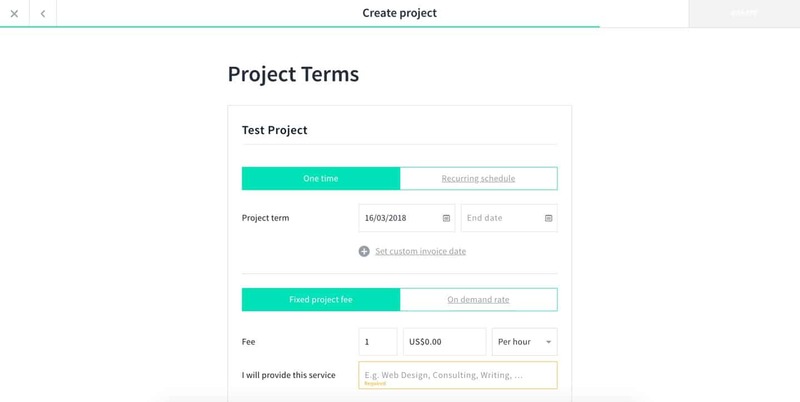 For example, AND CO allows you to assign time to individual projects, create and group activities, as well as automatically create invoices based on your timesheets. 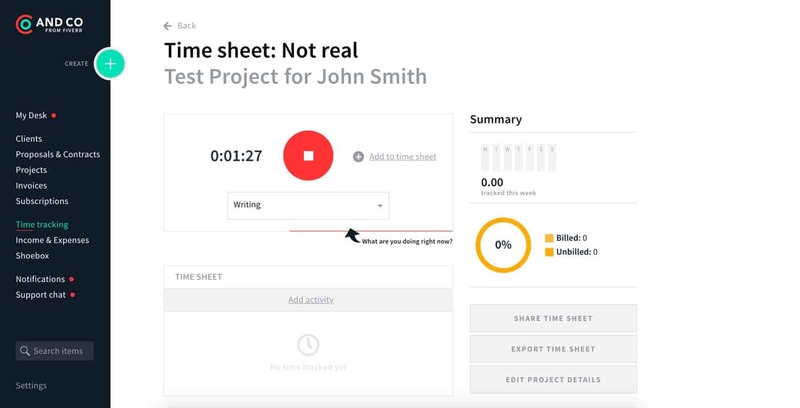 Much like other areas of this tool, the time tracking feature alone isn't going to win any awards, but it's certainly an easy, reliable solution for freelancers looking to track time and bill accordingly. For anyone on a monthly retainer or recurring fixed fee, this is a MUST have feature for you. Even the most basic invoicing tools will have you covered with recurring invoicing, which essentially just automates the sending of your invoice at the end of each month. 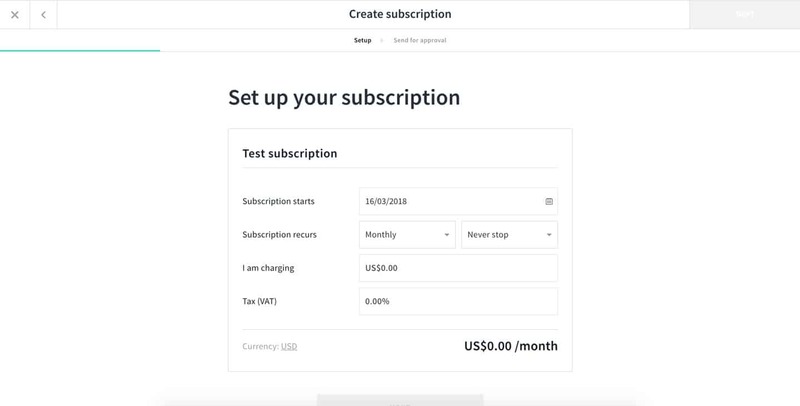 AND CO goes one better with subscriptions, allowing you to automatically charge your client at the end of the month. You simply set up a subscription and fire it off to the client via email, they input their payment details, and the software does it's thing every month - like your own personal debt collector. A very simple feature that'll take you less than a minute to implement, but one that could result in significantly more revenue, and less headaches. 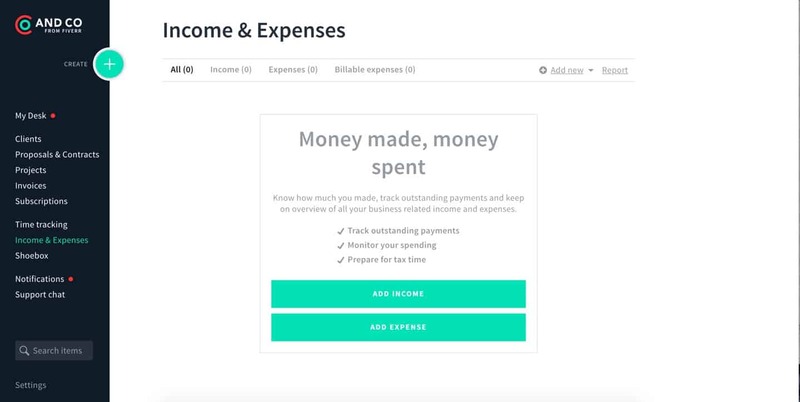 It was nice to see some accounting options here, which allow you to record both income and expenses in your business. From here, you can either add income or expense items. Clicking into one of these will take you to an interface that allows you to add more information. Yon't won't have to do this manually in most cases, since AND CO will automatically update your accounts based on your invoices. And, if you connect up your business bank account, you'll be able to automate virtually all of your expense tracking. Very simple, but also very effective. Finally, once you've got everything running like clockwork, you'll have access to a super clean reporting interface to get a quick overview your income and expenses at a glance. Despite not being a dedicated accounting solution like Freshbooks or BillyApp, I really can't fault what AND CO has managed to do here. The first is the notification system. Whenever you send out an email through AND CO, they'll not only tell you when it's been accepted, but also when it was viewed. Well, for example, knowing that a client has looked at your invoice or proposal will give you an indication of both when and how to follow up. I should also mention that you can see a full feed of all your notifications by going into your dashboard. <3 it. 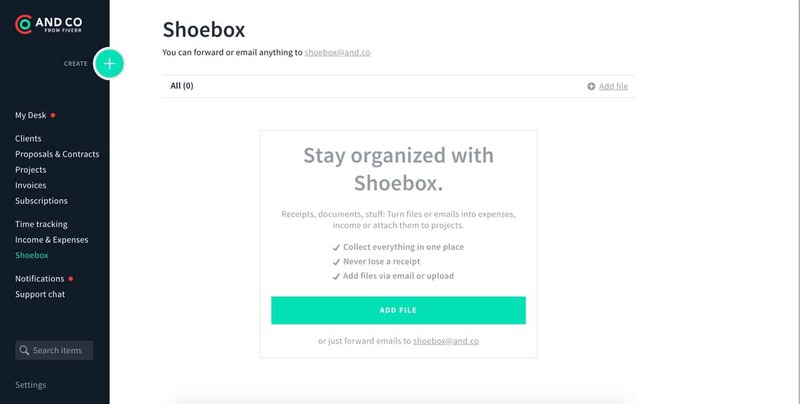 The next notable feature is the Shoebox. I'll admit, I wasn't entirely sure what this was at first, but I immediately fell in love with the concept. It's basically a collection for all your scrappy bits. You know, like random files, documents and receipts. You can even send these things to your Shoebox via email, by simply addressing your email to "shoebox@and.co". Finally, I want to mention custom branding. From the settings panel, you can apply some branding changes that will affect your account globally. So you can have your company logo and colour scheme on every email and invoice that goes out, without having to do this every time. It's fair to say that while AND CO isn't exceptional at any one thing, it is reliably good at everything. 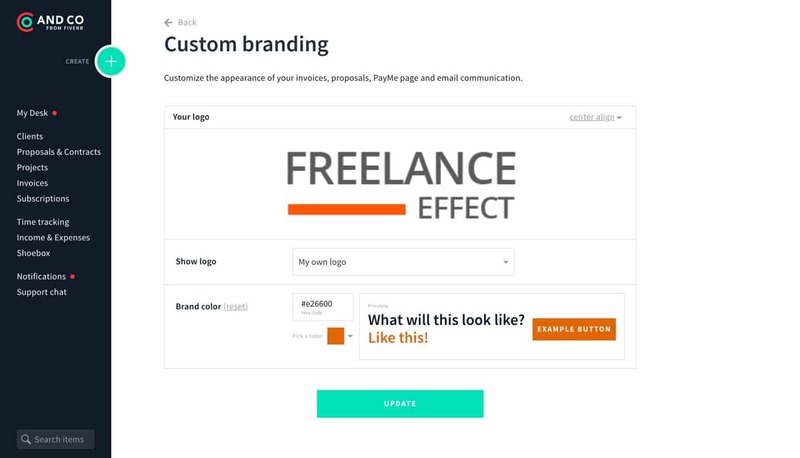 The clean, simple and easy to use interface makes it a viable option for the less tech-savvy freelancer, as well as being perfect for the more time-sensitive folk who just want to get in, get it done, and get out. 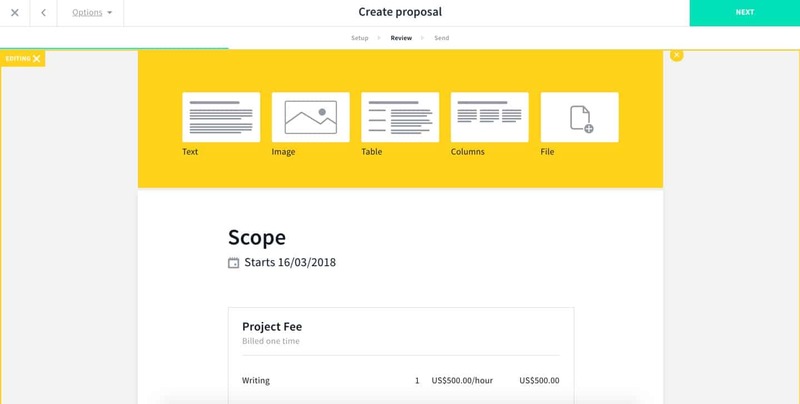 Considering AND CO is now a free solution, you really can't ask for a better business management tool at this price point. Click here to try AND CO. The one area I see as problematic is security. There isn’t much on their site in terms of their security and encryption protocols. I don’t know if I would want all my invoices and contracts living on a free platform unless I knew for certain that the data was encrypted and inaccessible by others. Also, as a small business owner, I have a strange peace of mind when actually paying for a business critical service. I trust the company will innovate and grow based on paid subscribers and a focused product, not some parallel revenue stream or obscure future roadmap. Just my 2 cents…!